I don’t know what it’s like where you are, but hoo boy, is it hot up in NYC right now–and it’s not even June yet, which means that it’s too soon to succumb to bowls of icy granita and dinners of frozen grapes and proscuitto-wrapped melon. Fold your cards now, and what will you do when summer really steps up to the plate (and God-willing, the Yankees) in July? Nope, no, can’t have it. But it doesn’t mean that tonight is not as good of a night as any to take a step back from the stove with something I fell upon two nights ago that was so gorgeously simple and different, I could imagine it keeping us cool all summer. My recent madoline purchase is giving me an excuse to delve into a surprising volume of recipes that are a hundred times more successful/less labor with a fierce blade. I’m always loathe to promote gizmos and gadgets–my logic being that all of our grandmothers cooked just fine without them–but I can’t imagine that paper-thin zucchini slices would be much fun to create without it. Though I’ve never had tuna or beef carpaccio before, I won’t even pretend that a zucchini variation is anything but comparing apples and oranges. But damn, was it delicious. 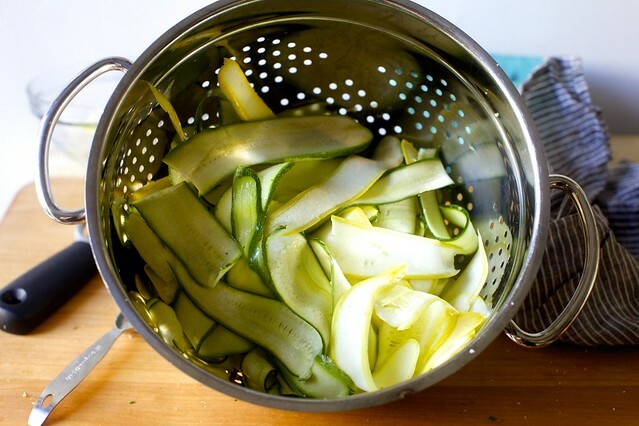 After slicing a few zucchini into translucent coins, you salt and rest them for a while before draining and rinsing them. 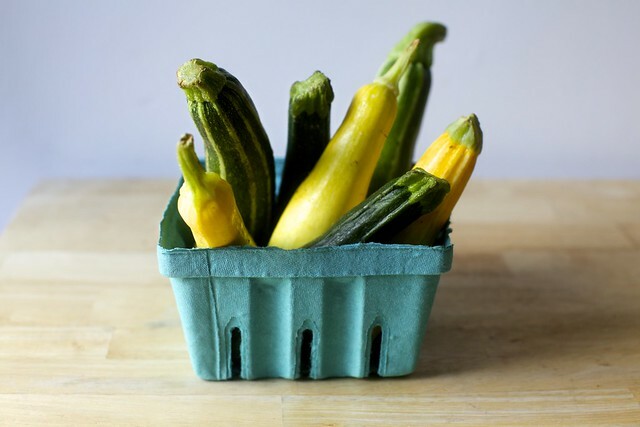 What this leaves you with is zucchini like I’ve never seen it before–fabric-like pieces that bend and fold, but retain enough structure that they’re nothing like the overcooked summer squash we’ve all had the displeasure of experiencing. Once you pat it dry (we were out of paper towels, thus I missed this step, and did regret it as the dressing slid too easily off), you toss it with a heaping pile of baby arugula, shredded parmesan, lemon juice, olive oil, salt and pepper. We ate it alongside crispy artichokes (siiiigh), but I can imagine it would pair equally well with some cured meats, baguette slices and a tomato/bean salad, or whatever your vision of a heat wave menu should be, so long as keeps you on this side of being mocked for a premature summer meltdown. In this 2018 update, I’ve kept everything in the recipe the same but wanted to mention three things: 1, no need for an adjustable-blade slicer or mandoline here. I use a vegetable peeler these days to make (prettier) ribbons of zucchini instead. This works best with thinner zucchini or summer squash. 2, I use a bit less arugula these days, maybe 3 to 4 ounces, instead. 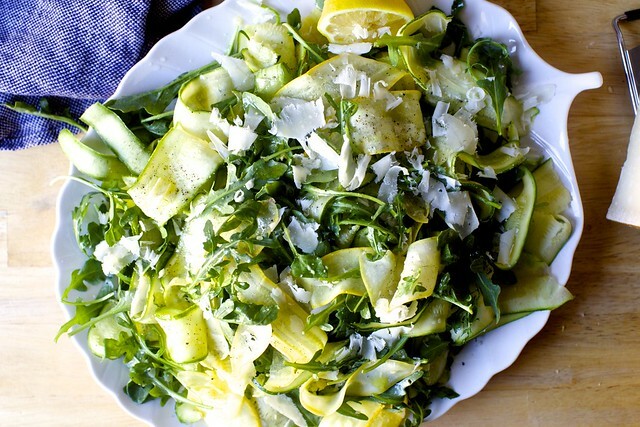 I love arugula, but prefer to let the zucchini star. 3, Finally, but perhaps you already know this: you needn’t follow the measurements, although they work perfectly well, precisely here. Season to taste, oil to taste, lemon to taste, parmesan to taste, and you’ll have something perfectly delicious. 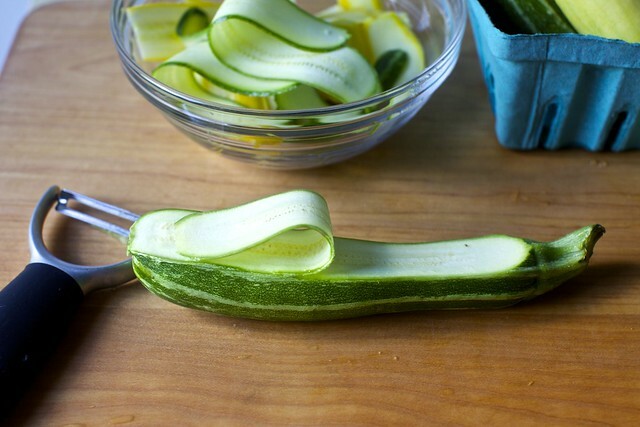 You can either cut zucchini crosswise into paper-thin slices with an adjustable-blade slicer, or use a vegetable peeler (this works best if zucchini are thin, thinner than the length of the peeler blade) to shave the zucchini lenghtwise into long ribbons. 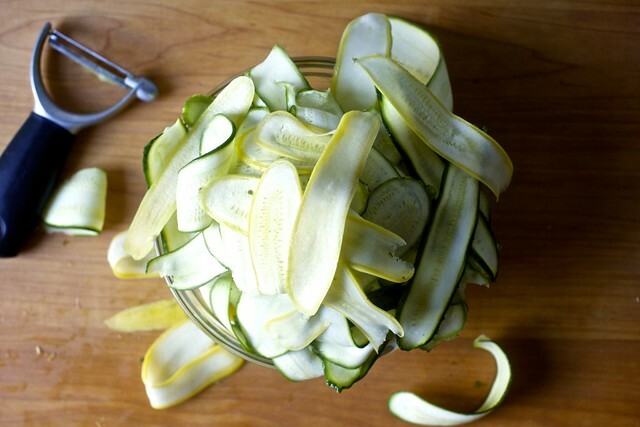 Toss zucchini slices or ribbons with 1 teaspoon salt in a large colander set over a bowl and let drain 20 minutes. Put arugula in a large bowl. Sprinkle with 1/4 cup parmesan and remaining 1/4 teaspoon salt. Drizzle 1 1/2 tablespoons of oil over greens and toss. 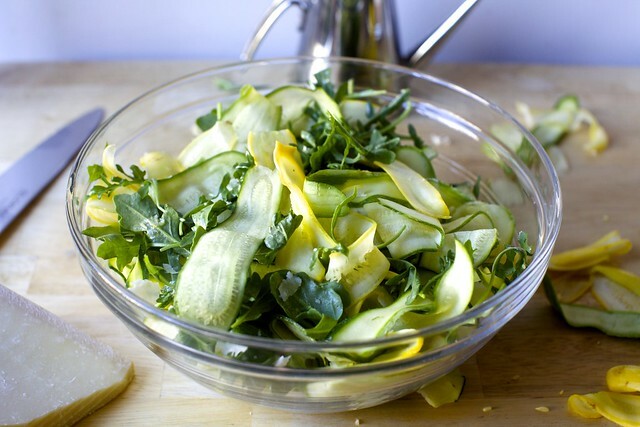 Arrange zucchini over arugula greens, then drizzle with remaining oil, lemon juice and sprinkle with remaining 1/4 cup parmesan and black pepper. I recently discovered your blog and really enjoy the inspiration. Thanks! Soon it will be in the 110’s here, with humidity from 20% to 80%, depending on the weather. Salads and other summery cool foods will be mixed with grilled foods to keep the cost of cooling down. It’s friggin’ hot here, too. Gonna be a long summer. I can barely drag myself outside to water my parched ferns. That salad sounds inviting … I’d like it on the patio tonight, please, with a glass of wine and some cheese, please. It is crazy hot here on the west coast too, what is with the bloody heatwave! This looks fabulous, cool and refreshing and your pictures are beautiful. Yet another reason I need to purchase a mandoline!! It’s going on my wish list right now! I was sweating as soon as I stepped out the door this morning, it’s terrible. But what is not terrible is imagining eating this salad with some charcuterie on a hot night. Yum. It’s hot here all the time (Puerto Rico), but the mountain breezes make it quite comfortable. I bought a madoline years ago, and threw it out the same day when I sliced the tip of my index finger off. Perhaps it’s time to try again. The salad looks great. Deb (or intrepid commenters): do you think a slicing blade on, say, an old cuisinart food processor would successfully replace the slicing power of the mandoline? until I got my mandoline. Oh. My. God. I even used store bought pasta sauce. Sorry you are so toasty already! Further north, we’ve enjoyed what the weather forecasters called a “back-door cold front” which has left eastern MA in the 60s and western MA in the 80s. Crazy New England weather. The salad looks delicious! I love the mandolin, so long as I remember to keep my fingers tucked under. yow. Mine has a little guard, too, to lessen the chance of digit damage. Elizabeth — I’ve considered it, and I suspect it’s worth a try. However, when I use it with cabbage for slaws, the pieces get a wee bit thicker (and unevenly sized) than I think you’d want here. I’m almost wondering if a regular box grater, which often have a longish opening in one area, might work as well. Perhaps a vegetable peeler would work, if wielded carefully? I can’t find a link to it, but I actually think that OXO makes a y-peeler that might double as a poor man’s mandoline. Hope that helps. I’m a new reader. I have to say that your photography is beautiful! I can’t wait to spend time exploring your site. From what I’ve been able to see so far, I’m going to love it. Marce — Looks great! Thanks so much for sharing. Love the addition of yellow squash. Oh boo hoo. Its hot in NYC. Could be much worse – you could be hot and humid (as it is in Chicago) and surrounded by a freakish and hellish number of cicadas (as we are in Chicago). They are the weirdest, grossest looking things ever and have no fear of humans. Two inches long, huge red eyes, and all over everything. The salad looks great, but we are subsisting on canned and frozen items while we boycott the outdoors. Do you have ideas on reviving really old pad thai noodles and some very frost bitten chuck roast? Oooh I’m coming to NYC so that if I’m going to be hot, I’ll be some place FABULOUS. Yeah, this Houston place is great but it’s going to get humid and yucky faster than my hair can curl. Also, the zucchini look delish. I’ve been a zucchini kick lately. Roasting, julienning, broiling, grilling…I feel like Bubba from Forest Gump. Initially I thought those were cucumbers and I wanted to run screaming from here, but alas they are zucchini and zucchini warm my heart! Actually, I have a very old wooden mandoline from my Grandmother. She made lots of cucumber salad with it in her day. Wow! Looks great! I have a mandoline that I have yet to use. Your parmesan makes me realize how much I need to buy some new Parm. Mine is quite dry! Claire — I actually use Grana Padano most of the time at home. It’s got a fantastic flavor, and is slightly more moist than Parm-Reggiano, which might account for the appearance. It’s also much less expensive. I have this whole GP versus PR shtick, but I’ll spare you it. I’m quite boring when I get on my soapbox. I’m so happy you tried the Fried Baby Artichokes…I think I’m addicted to those. If there is a bowl in front of me, I eat them unconsciously like potato chips. I’m not as coordinated as you are – the Japanese mandoline took nicked the fingerprint off my third finger!!! I only recently worked up the nerve to use a cheap mandoline I’d had for a long time. Totally wonderful, but now that I see the paper thin slices you got, I think I need to upgrade to a more adjustable one. Steamy Kitchen [and everyone else who’s ever reported a mandoline-related injury]–use the freakin’ guard that comes with your mandoline! Seriously! I adore my Oxo mandoline — when I bought it a year or so ago, I was a bit embarrassed to add a gizmo to my kitchen arsenal. But now I cannot imagine life without it! 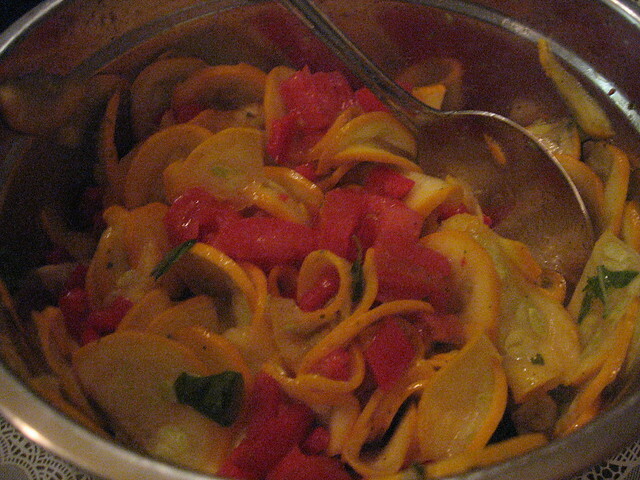 The first thing I made was something similar to this salad — thinly sliced zucchini, cucumber, tomato (only really works with plum tomatoes) — every veggie in the house — tossed with a vinaigrette. It’s hot here in Indiana too! THe salad looks lovely and cool! Watch your fingers on that mandoline! I think that what goes wrong with the fingers versus blade is guessing when you need to switch to the guard. Obviously, if you have a whole zucchini to go, for example, you can’t use the guard yet (at least not on my cheapo one). And then you probably think as you get near the end, oh, I can get a few more slices before I need the guard and then the rest is history. Of course, I’m just guessing. We’re still Deb 2: Mandoline 0. You’re making me want to get a mandoline. . .zucchini defines summer for me. Zucchini Pie, Zucchini Crab Cakes, grilled zucchini, stuffed zucchini. . .and this will definitely have to be added to the mix. Heck, its payday. . .I think I’ll look into getting an inexpensive one like you’ve got. i went to the chelsea kitchen supply and got a mandolin made in japan for about $27-ish…is that the same one you have? Hi Mez — We probably got the same one. I got mine at Bowery Kitchen Supply in Chelsea Market, where I buy almost everything. I love a cucumber salad, especially with a bit of dill. Apple cider vinegar is not my favorite, but I suspect it will do. I think that salting them and pressing out their extra liquid–as I did with the zucchini above–is a great approach to a cucumber salad, too. the yankees look hopeless.. and that picture of the slice of zucchini with the back lighting of the natural light looks awesome. Hey cool I need to get me one of those thingies. You know Debbie, you could make one of those awesome German cucumber salads like they make at Zum Schneider too–I always order them even though they often give me food poisoning. It’s thinly sliced cucumbers with yogurt, dill, salt, maybe sour cream and I don’t know what else. Maybe a little lemon juice but definitely not garlic because Germans think garlic is, er, Romany food. (Trying to be politically correct here!) Also, my recipes aren’t very precise, sorry. You’re absolutely right in my case. The cucumber was too long for the guard, and I did one slice too many. Also, while the guard worked well for a potato, it was useless for a carrot. Now, I would simply throw away the last 2 inches. Please send some of your heat to California! It’s practically COLD and most certainly windy. I’m ready for summer. We’re pretending it’s summer and bbq’ing on a regular basis, so at least there’s that! The first time I used my mandoline, I sliced off part of my finger. I was making zucchini carpaccio, while Molly (Miss Orangette) made a souffle beside me. Did that stop me from using that mandoline? Heck no. Now that it’s starting to be zucchini season here in Seattle, I might just have to steal that mandoline back from the Chef (somehow it ended up in the restaurant kitchen) and dine on this for days. I just stumbled upon your blog and it’s great! Reporting back on alternate slicing methods: the food processor indeed made too thick, uneven slices, the box grater made slices of the right thickness about half of the time. I had the most success with my vegetable peeler; however, the ample midwestern zucchinis I used were too large and I couldn’t make full slices. I settled for half circle slices. After vegetable peeler-ing my way through 3 zucchinis and 2 yellow summer squashes, I have vowed to buy a mandoline and never look back. Thanks for the suggestions, everyone! I agree with you–damn, that was delicious! I made this recipe for my father’s birthday brunch. It was greatly enjoyed by all. I dug out my cheap mandoline, which I had never used, and it made swift work of the slicing and my fingers are still intact. I am sure to make this many times, and I can’t wait until this summer’s local zucchini crop starts to appear. Thanks for a superb recipe! Yum! It’s what’s for dinner (with the addition of toasted pine nuts, crumbled goat cheese and chopped fresh basil.) Thanks! to be honest, i just discovered your site and i plan to make the most of your recipes – they’re amazing so far:) i just had the first taste of this gorgeous salad- i omitted parmezan, since i didn’t have any but i added roasted sunflower seeds and some garlic – it it wonderful. Thanks so much for providing those! I used my mandoline for the first time for this recipe. I am officially obsessed with the mandoline. Who knew slicing could be that easy! I took this salad to our father’s day dinner with the husband’s family. It was a hit. Thanks for another great recipe. I know this is a WHILE after you posted this recipe, but I wanted you to know this salad has become a favorite in our house! We don’t have a mandoline, so I use a regular vegetable peeler, and it turns out great. I often add chopped prosciutto crudo, diced tomatoes, and cannelini beans to make a meal out of it. Fabulous! “Long time reader, first time commentator” – I made dinner for a friend last night and tried two of your recipes – this one, and the roasted cherry tomato pasta sauce. Both were absolutely wonderful. I love seafood pasta, so I added a little white wine and some scallops and shrimp at the end, and served it with fresh fettuccine and it was terrific. I thought this salad would be almost an afterthought, but I adored it, and I think it was even better than the sauce. Truly wonderful, so light and refreshing. Thanks so much for your wondeful recipes. I want to tell you that I think I love you. Everything you have on your site is amazing. When I’m in a stump I come here and I end up with a million dinner ideas. I’m making this with the zucchini rice gratin, and roasted spicy sweet potatoes for dinner for my mom’s birthday with the nectarine and marscarpone tart for dessert! This is delicious! Thanks for another good one. We finally got through the zucchini from last week’s CSA box and a friend just dropped off about 20 lbs. of zucchini and cukes. I’m going to need every recipe you’ve got – and, it is now clear, that we have to buy a mandoline. I’m sure I will wonder how we ever survived without it. Made this tonight with yellow squash and zucchini and it was fabulous. Fresh and delicious without the sogginess you get from cooking squash…at least when I cook it. Loved it! Delicious! A great new way to eat one of my meal staples – zucchini! Thanks for the recipe! I’m so happy to see this recipe here…I made it the summer it appeared in Gourmet, and it was loved by all, even zucchini loathers. And then, of course, I misplaced the recipe. This was a simple, wonderful salad! Thanks so much for refreshing my memory! Thanks for this recipe. The garden has just started yielding zucchini (mutant sized, since 1 yielded a pound and a half) and this was FANTASTIC tonight. (We have a mandolin, but blessedly, I didn’t have to use it since he’s a chef — he sliced it all up) Thanks again for an awesome addition to dinner. The salting and drying makes for extra work, but I made this for a buffet yesterday and it got rave reviews. Thanks for the recipe! And oh my god!!! What an amazing transformation!! I just got two giant zucchinis from the CSA and was wondering what to do with them. And baby two heaping handfuls of baby arugula…how perfect! Now if you could just tell me how to make beets anything less than disgusting, I’d be extremely grateful, because I have four giants that I don’t know what to do with. I see this is an old post, but thought I’d comment anyway. :) I do a lunch every month for about 25-30 women at my church. I was looking for a different salad recipe and checked out a lot of sites, nothing really caught me. THEN, I saw your blog listed, and immediately checked you out, ’cause everything I’ve ever tried from you has been really good. I already know this one is going to be a huge winner. You made my day! You’ll the the first one I check out every month from now on! I love this salad so much! In addition to being great in the summer, it is the perfect accompaniment to a Rosh Hashana dinner. The green is a great pairing with all the starch typically served and I always have a ton of garden zucchinis this time of year. I usually serve it over an arugula/spinach mixture. This is a great salad. I used baby kale that we had on hand instead of arugula, and added some minced jalapeño and julienned basil from the garden. It’s a really fresh way to use some bountiful squash. Made this with 2T of oil and it was perfect! It was so hot today, this looked like the perfect salad. I couldn’t find any arugula, so used a spring mix instead. It was so easy to make and so delicious! Paired perfectly with grilled fish, corn on the cob, and SK’s strawberry rhubarb bars. This is an outstanding salad. So easy, very original, tastes great. Served it as a starter for a big dinner – couldn’t have been more perfect. Every guest wanted the recipe. Boom! This is an easy, fresh, light summer side. One note I’d add- this wilts pretty quickly once dressed. It’s still delicious, but maybe a little less beautiful, so next time I will dress just before serving and serve immediately.